Obviously the right thing to do was to fling myself down on the sofa in our bedroom and immediately read that e-mail, and then go to the Churchmouse site for more eye candy. Which is what I did, giving myself a five minute break that felt as refreshing as a long nap on a chilly, snowy day. Churchmouse Yarns and Teas is for me the ultimate fantasy yarn shop. If I could go to Bainbridge Island and shop there... well, I can't even imagine how amazing a vacation that would be. It's like an otherworld in which everything is perfectly curated and beautiful and accompanied by a steaming cup of tea, and there are no biting insects or cold viruses, ever. It can't be easy to run a yarn shop, can it. I mean, as compulsive as we may all be about our knitting, there is only so much yarn we can use! And yet a shop has to stock so very much yarn, in reliable dye lots. The only answer is to build a community loyal enough to keep buying what yarn is needed, at full price and in that particular place... then keep them engaged in using said yarn so they keep working through their stash. An online shop that's an extension of the feeling you'd get in person is a bonus but must be just as challenging, requiring expert photography and web design. As it happens I haven't bought a lot of yarn from Churchmouse, because I really do have too much (and in fact, got rid of quite a lot last month because I finally accepted I did not have space to store it all!) But I have bought several of almost all the tools Churchmouse offers, and a good number of the knitting patterns as well. When I do get a parcel from them it's so perfectly packed in gentle tissue I let out a little sigh of gratitude for that glimpse into the ideal world they've created, where we are all cared for and nurtured as by the most loving of moms. Yarn stores: they are so much more than their yarn! I found Churchmouse through its patterns but I found PurlSoho when Emily of Viola yarns tipped me off about what a rabbit hole of project ideas it is. It's got a cooler, temperature-wise, aesthetic than Churchmouse but it covers sewing as well as knitting and crochet so... equally satisfying on a day when you are looking for a sense of No Clutter Creativity. And if you subscribe, their newsletter includes free patterns. That particular day I described above was the first time I got to use our bedroom sofa for something other than putting on socks. Those two big pillows are too bright a white for decorating success, but they are a dream for neck support, and from that spot you can look out at our tree and any clouds that are drifting by. It's pretty great, but having all that as a backdrop while losing yourself in the Churchmouse site is even better. Do you have a favourite escapist craft site to share? The idea of a dedicated baking counter has been calling out to me for about fifteen years now, and finally: it is a thing that exists in my very own home! In the old kitchen I had to careen my stand mixer over from one side of the sink that served as a paper dumping ground to the other side of the sink, where all the dirty dishes piled up unless it was a baking day. I had about 30" of worktop into which the mixer had to fit, and if I was baking I had to do all the dishes and not be cooking supper at the same time because any veg chopping etc. would have to happen in the same place. Okay... if you read Smitten Kitchen you will realize I had a gymnasium's worth of work top compared to a tiny NYC apartment kitchen... but still. It felt cramped. Admittedly it is not 100% easy to bake on a counter that is just about 18" deep, but because our kitchen table is immediately behind me while I'm working I can comfortably set baking pans on that. Or I can cross an open area of four feet or so and set them on the counter beside the range. The only real trouble is when you are knocking flour into the bottom seam from the tiles at the back of the counter, and then having to clean it out after. That's a little bit Ugh! Measuring equipment and mixer attachments on the left, canisters (and bags) of sugar and flour on the right. 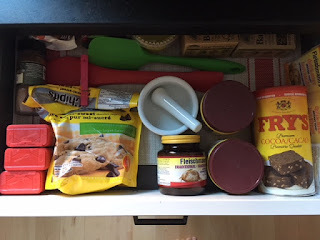 One of the top drawers has small-size essentials like muffin papers and baking powder and as-yet unopened yeast. The other has recipes and my apron and some cookie cutters. It is so nice to have a shallow drawer so all those things are easy to find! I might change up the layout a bit actually, so that I can have measuring spoons in the shallow drawer alongside this one. There is a lot of fine-tuning yet to do and I'm just so pleased that I finally have a little time in which to do it. Note the recipe cards held in place by favourite model cars - priorities! I love keeping my flour in that giant stainless steel compost bucket on the right. It holds a 1kg bag of flour and has a loose-fitting lid, which is a terrible idea if you rarely bake such that the turnover is slow, but fantastic if you bake a lot and just want to scoop right in for the next recipe. it is still fun to try new recipes. It is ridiculous even to think about this since I live a ten minute walk from five excellent bakeries, but... I am still looking for my dream bread to make at home. I lost count how many recipes I tried out over the break, aiming for 'overnight or fast rising' and 'not too many complicated ingredients'. The final consensus was that based on current data you can have Good and Complicated or you can have Easy and Bland. The tastiest was a brioche from Smitten Kitchen with all the interesting bits left out, and luckily, its four egg yolks match up neatly with the four egg whites I need to make chocolate chip meringues. And in practise, it is a whole lot easier to imagine doing that now that I don't have to clear everything away just to try. Thank you baking counter!! After the infamous Work Triangle, one of the basics of kitchen design is to have a window over the sink. Who doesn't want something to look at while washing dishes. It's logical as far as it goes, but the view isn't always going to be of lush expansive gardens, or even a forest and a bright blue shed as at our little summer cottage. This is the view I picked when we were deciding where to put and how to lay out our new kitchen, not including the vintage linen drape that masks the frosted glass of our neighbours' bathroom a few feet away. It was that or the unobstructed view of another neighbours' trampoline... and I quite like the texture of a shingled roof, don't you? Also, there was the tree to consider. Lovely stark branches in winter, vibrant yellow-green blossoms in spring, softly waving leaves in summer and a riot of colour in the fall. But about four weeks after we moved home I heard a funny sort of engine outside. Oh dear. It was the city's tree-trimming truck and I soon discovered they were removing THE WHOLE THING. Now, what I get to look at is telephone wires and snow on an asphalt roof. Unless I can figure out how to wash dishes on an angle? In which case I still get a big chunk of tree. Honestly though, who am I to complain? When we move back to our condo some day, I will be looking at the wall dividing our kitchen from the that of the people on the other side. 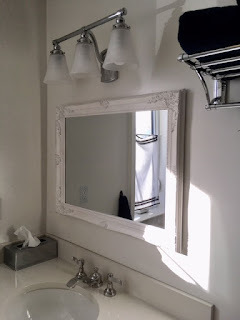 Then it'll be either a mirror or a painting that imitates depth or some very nice wall tile. I vote for a painting, but I guess it'll have to have glass over it for the splashes. That's a nice new project isn't it, learning how to paint such a thing myself or finding somebody who can. If you could paint your own view from the kitchen sink, what would you choose? Two words: Tom Bihn. Do NOT go to the Tom Bihn website (linked, because I am a terrible person) if you would like to avoid buying, or at least wanting, a new bag. Today's post will be illustrated by unrelated arty pictures, for your safety. It may not seem risky at first - I have been many times over the last couple of years without any apparent lasting effects - but those bags will linger in the back of your mind so that some day, when you need a new suitcase and can't find just the right thing anywhere else, you click over there to remind yourself why you didn't want one really, and - Blammo! You are pining for a Tom Bihn bag. There are forum pages at the Tom Bihn site, very helpful for people who are dithering over one bag versus another before opting simply to buy both plus one more because they will all be amazing. But hello: forum pages? Miles and miles of them on every conceivable subject related to luggage? That's a big warning sign that these bags are addictive. I have been reading this fascinating book called Women's Work, by Elizabeth Wayland Barber, a very lucky person who grew up knowing about spinning and weaving and actually managed to make an academic career out of the history of same. Many items in this book are jumping out at me. Like, there was this magic island lifestyle in a few different places where people didn't have to worry about being attacked since they were - on an island! In that environment people were able to build a whole society around feeding and clothing themselves with help from the plentiful plants and animals they had at hand, and life was fantastically good, until they were wiped out in an instant because it turned out they were living ON A VOLCANO. moral of the story: everything in life is a tradeoff. But my favourite is the idea that the discovery of the wheel, which was earth shattering enough (perhaps even literally), takes a back seat to woven cloth. Because woven cloth can hold stuff, which allows you to move around with tools, which in turn allows you to think about creating more tools. I am probably misinterpreting what was actually said in the book because animal skins also allow you to transport things, but those predate the wheel too. And I like thinking over whether the modern world did not begin with wheels but with BAGS. I am pretty sure that people who travel for months in Asia with just one wheel-free carry-on would agree that it did. Back to Mr. Bihn, another lucky person who has been able to build a career out of something he's passionate about. GAH. Why can't we all do that. After many, many hours on the site I think I have cracked the secret of why Tom Bihn bags are so very dangerous to otherwise rational bag-using people. It's nothing to do with the fact that they are exceptionally well made, or thoughtfully designed, or perfectly sized and organized, or offered in many attractive colour combinations, or even that people say their bags still look new after many a long year of use. It's because of the pictures and videos! Wait, don't go over there to look, it's too risky. I will just tell you, with 'The Maker's Bag' as an example. Again with the link... oh dear, I really am not a nice person. Okay: we are talking about a cross-body satchel with a top that folds over the front and clips down at the base of the bag so what's inside stays there, and stays dry. There is even a waist clip, which is useful is you are wearing the bag while cycling to some scenic spot to make art. I am particularly impervious to the lure of such a bag because as much as I love being hands-free, cross body bags have ruined SO many of my coats and jackets - plus, they look weird on me - and my shoulders slope too much for a bag to stay on me with just a shoulder strap. In addition, I am WAY too lazy to unclip and/or lift a long flap up out of the way to get at what's inside my bag. I prefer a big open bag that works as an extra pocket as I am racing along a sidewalk on foot, multitasking to a dangerous degree for a person who has already once fallen on a sidewalk and broken fingers. With a zip closure and the option to hold it close in front of me, in case of rain or pickpockets. And yet. Every picture of The Maker's Bag shows it filled with things that are just a little More than what you might think of normally. I mean you are not seeing gum in this bag, or Kleenex pocket packs, or elastic bands for whatever practical reason they exist, or even candy bars. Healthy granola bars, yes. Keys, demonstrating multiple doors to unlock and locations to be, yes - though those are always shown on a long tether so they never fall on the floor of your porch while you're fumbling over a new lock. Also a phone and usually earbuds. But mostly what you will notice are tools. For knitting or painting or whatever. If tools are in a person's bag, you have to wonder: are those activities THAT big a part of their everyday experience? Ditto the 'Shop Bag', a reusable grocery bag which is about as basic a bag as there is. But is it shown crammed to the top with bags of milk and rolls of toilet paper and a packet of dishwasher detergent? Nooooo! Try, gorgeous leafy lettuce and fresh flowers. Just thinking about the Shop Bag could make your life healthier and more attractive. Tom Bihn bag owners are living lives filled with meaning and purpose. People who carry them are not simply surviving, scraping through every day as a reactive experience to the things that happen to them, like runny noses or coffee breath; they are MAKING their lives, dreaming them and then acting upon them. And also, there was a very strong message to me personally that I must buy a big wide watercolour brush for background washes. This is a super exciting achievement disguised as the most boring Hug post EVER. Lookit! I hung up a shelf without help! You might have seen this before because I did the job last fall and may have shown you office pictures since. But today I want to take the time to tell you what an amazing accomplishment it was for me to get a shelf on the wall. Because it is not just any shelf: it is the ugliest shelf in my stash of small vintage kitchen or bathroom shelves. For some reason I love these one-off things, and have been collecting them since we first bought our house to stick on a wall someplace. But this particular one never worked out in the house pre-renovation. Too plain, I think, or too wide, and definitely too tippy at the bottom to stand freely on a counter. I bought it at a junk shop years and years ago, mainly because it was solid and because I'm always attracted to the idea of a shelf that does double duty as a towel bar, even though I never end up installing those near a sink. It had two hooks on the back so once it was dry I strung some picture wire between them and slung it over a nail in our junky storage room (now a cute laundry room with a heap of junky storage in it) and thought - hmmmm. It was pitiful. We kept spare light bulbs on it and I was always worried they would fall off and break because the shelf was so sad. 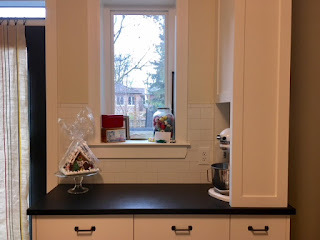 When we renovated the house I had bigger ideas, especially once I noticed this particular shelf was almost as wide as the table at the end of my desk where my sewing machine lives, and appreciated its clean lines as an asset rather than a bore. First, I painted it (and two other shelves) the same colour as the walls in the office - Farrow and Ball's Clunch. Then I pretended it didn't exist for a really long time because I didn't want to ask Ray to help me hang it and I didn't know how to do it myself so that it would function a little better than it had with the picture wire. Then I took another look at the back and saw it had, in addition to the hooks, two little recesses to slip over the head of a screw. because that's two screws, not one, and they have to be level and perfectly positioned to match what's on the back of the shelf. And I didn't have a drill handy and Pete was out so I couldn't ask him where the drill is and anyway, did I really want to use a drill on my office wall? And then I measured super carefully. And used the level that Les gave me lo these many years ago. I know, I know, the picture isn't straight, but the shelf is. There you go! That's me, turning clutter into something useful! Even with the bad preliminary staging I was and still am ridiculously proud of myself about it, can you tell? WHY NOT DISTRESS IT WORSE, INSTEAD?? sorry for the shoutiness, but that's how loud the thought was. A little affection from some sandpaper and it was good to go... I am totally remembering that trick next time I notice something that needs refinishing. Now of course I need to fuss more with what goes onto the shelf. I mean the vintage linens are nice, and I appreciate having a designated space for the bunny who goes with me on planes and to the dentist, but I'm not sure this is its best use. Do I focus on sewing aids, inspirational items, colour staging, or just plain storage? It's on the wall firmly enough to take weight, I can tell you that much, but it's a little shallow even for paperback books. Hmmmm. Of course it's socks. And this year, as last, it's alpaca sleep socks. There is never quite enough alpaca in one skein for me to make the size of socks I want, with a longish leg and a roomy foot, so I pair the alpaca with colour-friendly scrap yarn all down the legs. 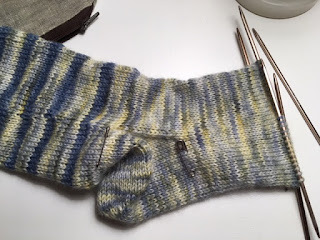 I was so happy to find that this denim-shaded leftover DK weight superwash wool from Twisted Fiber Art matched the blue in the blue/yellow/cream alpaca because I knew they would look amazing together and they really do, don't you think? The DK yarn is MUCH heavier than the alpaca but when used in small stripes like this the combination produces a nice textured effect that I think will feel nice on. Doesn't hurt to have a generous cuff at the top either, for when you're pulling them over your foot on a chilly evening. At this rate they may end up being Valentine's socks! But when they are done, I will be able to photograph them in some fetching scenario like I used to, because the house really is almost done now and all the floors are clear of boxes. It's incredible to me that we started this journey - what, three years ago? - and in all this time I haven't been able to take photos of finished knits outdoors or even in very good light. Or, frankly, finish many knits. When I pulled out this sock to photograph for you the tails of all the stripe changes had plied themselves together into a big rope, which loosened for the camera but did not disappear. Made me miss spinning so much! Nearly there though. I can tell the renovation is almost done because I have noticed a distinct drop in the number of decisions I'm required to make in a day. The biggest one on Sunday for example was just whether or not to let Gwen have a turn with the needles. Hope you are having a good week so far and I will see you tomorrow! All my life I've hung artwork on bare walls and now I'm wondering, did I miss something? Because WOW, the difference a mirror makes! (WOW again, the difference an artificial tree makes on holiday stress levels and scheduling) I will move our floor lamp back to its spot and maybe we will still have a glow. And they look fantastic together. One is opposite the window and reflects daylight back into the room at one end of the day; and the other contributes either lamplight or daylight from the other end of the horizon. Both also reflect the ceiling light in the dining room and that is less of a success because I bought two chandeliers to hang over our long narrow dining table. You are crafty so I know you know why: you need bright light for cutting fabric and knitting with friends and doing meticulous needlework! and what else is a dining table for anyway? But it is kind of overkill and technically, I should do something about it. I could get a dimmer on the chandeliers. I could also put in 40-watt bulbs. I admit it was a little crazy, the desperation of a person who has gone years without ceiling lights, to buy 60 watt bulbs for two fixtures with six faux candelsticks each. Pete was squinting when I tested this out the other day, and he's the one who wanted bright lighting everywhere. Still! When the curtains are open and we have natural light, we don't need the chandeliers. And when we are actually dining and want softer lighting, the piano mirror can reflect back the light from the sconce lamp there, and we can supplement with candles. I've been seeing artfully melted faux pillar candles with waving faux flames triggered by LED lights that work on a timer. I am SO into this concept. A trio of them near the bathtub would make such a soothing soak after snow shoveling don't you think? And also, obviously, another trio would be an asset during an elegant meal in a dining room when placed on a mantelpiece or ranged down the middle of the table, with no wax to clean off the tablecloth later. Back to my point: our dining room was nice enough once the furniture was in and the drapes hung, but after the mirrors went up it was a space I want to be in. I put a chair into the front hall to help with boots going on or coming off, and now I find myself drifting there to sit with the phone during a chat, or to catch up on the news, because when I look up I will be looking into that dining room. I find myself obsessing about treating it as a conservatory full of plants. Me! Who can't grow anything! 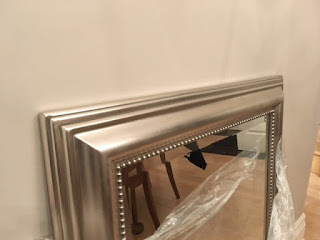 And all because of a pair of semi matching mirrors I should really have returned to the store but didn't, as I am far too lazy. Mirrors, people. They are amazing. Also we finally chose mirrors for the two bathrooms that have been mirror free this whole time, and they actually got installed. I LOVE THEM. and they were the cheapest things we bought for the whole house. I think I paid more for wastebaskets. Which means I overpaid for the wastebaskets, obviously, but let's focus on the mirrors instead. Ray says they will be okay as long as we don't expose them to steam. Good thing he put a serious ceiling fan into the master bath, huh? There's a shower in there.